branding it with his want. draftish poem for Brendan’s prompt on Real Toads to write of a paramour that led us to write. Brendan’s prompt, which is a very interesting read, discusses certain Greek traditions of poetry. Which lids me to the pic, a painting I recently did. I’m not sure it fully fits, but it was my version of a a Roman painting (which was Greek to me). This entry was posted on March 12, 2016 at 3:23 pm and is filed under poetry, Uncategorized. You can subscribe via RSS 2.0 feed to this post's comments. The cant of can’t – out of the mouth of a despairamour – so clever and so different. Love it. This portrays a somewhat darker side of love, which can certainly give rise to the expression of poetry. I’m not sure if this was your intention, or simply my reading of lines such as those in parenthesis, which strike me as containing a painful truth: a paramour might feed off one’s discomfort and sorrow for his/her own pleasure. Disparamour! I was wondering how many variations we’d find. The dark animus is this naysaying, critical voice, like the angry daddy and drunk sugardaddy, binding your mouth to a tree. What is it when one can’t speak but the hands are free to write? 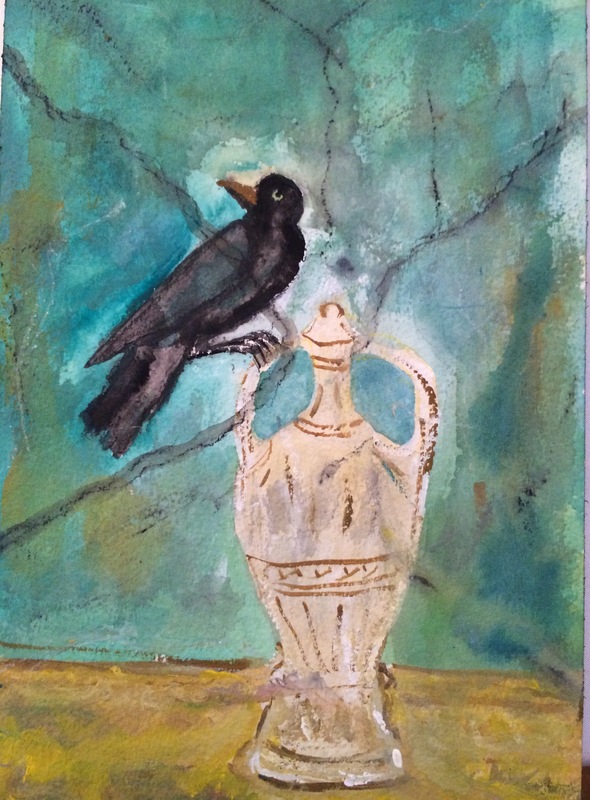 Perhaps that is the crow on the jug. Did you ever read Marion Woodman’s “Addiction to Perfection”? She writes that many successful women carry this brutal crow on their shoulder that hisses scorn for her every achievement. Your dispararmour cawks that vibe. Well done. Ha, thank you Brendan. I haven’t read it, but will look at it. And thanks for the very interesting prompt. I was thinking of bark as the sound but did not mind the dryad aspect! Thanks again. Yes, I mean it really in a rather metaphorical way. Not neccessarily a physical lover as many seem to surmise. K.
Great ending K! One was left wondering what a lot more were there to keep the raucous night revolving without control. The last stanza made me giggle. Clever I enjoyed it! Some relationships start in pain, move towards agony, and leave us gasping for what we hope is possibly air… This is very intense, K. I found myself stopping when I got to “his gorge” and starting over… then reading the whole thing again. I was so glad for the last two lines. the ending was my favorite. yes…a door and a future open to possibilities. go get them! Lovely! Full of delicious double meaning. “despairamours like to hear the moans they’ve forged).” Love that line! Excellent metaphor, K…a very physical read and I enjoy the textures.